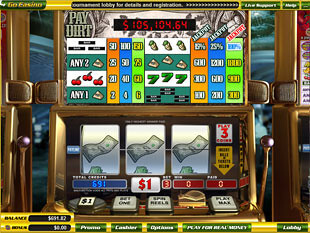 Pay Dirt Slots is a 3 reels 1 payline video game released by Vegas Technology. Luck and money are the main things that inspire the creators of this slot. With the top jackpot of 1,800 coins and the opportunity to win incredible progressive jackpot this game is worth your attention. This game is available in no download format. It is a classic slot with such symbols as Cherries, Single BAR, Double BARs, Seven, Money Fist, Eye of Paradise, Star, 4-Leaf Clover, Dollar Bill. Note that only some of them can bring you attractive prizes. The highest jackpot is 1,800 coins or $1,800 for 3 Eye of Paradise if you bet 3 coins per line. The second jackpot is 1,200 coins or $1,200 for 3 Eye of Paradise if you bet 2 coins per line. 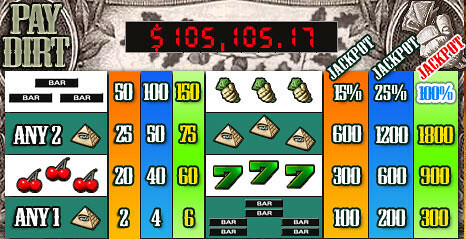 The third highest jackpot is 600 coins or $600 for 3 Eye of Paradise if you bet 1 coin per line. Play with 3 coins per spin and try to get 3 Money Fist icons on the payline to win the progressive jackpot. If you play with 2 coins and get 3 Money Fist icons on the payline you will win 25% of progressive jackpot. If you play with 1 coin only and get 3 Money Fist icons – 15%. Pay Dirt slot machine is a game with quite simple rules that allows you to win the progressive jackpot playing with maximum coins bet. It is a good chance to win great prizes.